Hello World! I'm Reading You Up! Usually this monologue becomes a conversation with my similarly travel-addicted husband, and soon (although not always soon enough) we have a trip on the calendar. Before children we took one airplane trip a year, alternating between a stateside adventure and an international excursion. After children…well. Children are an adventure and an excursion on their own, and I remember quite clearly a God-ordained “travel-epiphany” during an early morning nursing/snuggle/put back to bed session with our firstborn Kenzie. In that vividly remembered moment, of carrying Kenzie from the rocking chair back to her crib my heart cried out to God, my children, and the world at large that this journey of mere steps was a journey I would gladly make to the exclusion of all others. I meant that cry, and still do. This journey of motherhood and family is one I gladly have sacrificed personal dreams, goals, and hobbies to plunge into. For the first few years of newborn life (since we added a second baby to the mix less than a year and a half later) we traveled to see family and primarily within the state (because y’all. Living in the center of Texas means leaving Texas takes a loooong time). There was that trip with my parents to New Orleans, 6 month old Kenz in tow…Baby on Bourbon Street! Just kidding. Well, except for that one photo op. Moving along. What has been so exciting for our growing family is sharing with them the stories, people, and cultures of the places we have visited. A gorgeous silk rug from my time in Morocco as an undergrad hangs in our stairwell, a piece that has prompted Kenz a number of times to ask, “Where is that from again Mama? Will you take me there someday? Who lives in that place?”. And my heart for the world beats a quick tattoo with the love I feel for my children as we discuss the wonders God has made in people, language, dress, and custom. 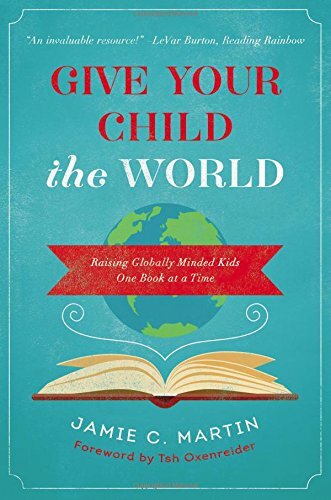 Which is why participating in the “Give Your Child the World” Read the World Summer Book Club sparked a keen interest. Credit to my dad, we have been learning about a new country each month through the Highlights Top Secret Agent Adventure packets. I have supplemented those packets with library books from each country, and an attempt to make a dish of that country during the month. The books we get easily…the food. I’ll just confess - cooking is not my forte. When news broke that a travel-bug mama had written a book including eight chapters of booklists, divided by world region, I couldn’t resist! Talk about a treasure chest that sparkles when opened! So, for the next nine weeks (today being the Friday of the first week) my kiddos and I will “hop a plane” aka “open a book” and travel the world. One day we will all physically adventure in lands unknown, among people who share the image of God but bring such diversity to our experience. Until then, thank the heavens for books that open the portal and for individuals who share their favorite stories via lists! I encourage you to come along with us, and stay tuned as we share our jaunts along the way. Olivia was thrilled at her book selection. I mean thrilled. Look at that face!